Introducing Legend When you order a Legend Bicycle by Marco Bertoletti, you can visit Bertoletti’s factory in Lombardia and watch while your new custom bicycle is being made. Access to Legend is controlled by heavily constructed galvanised steel gates, at Viale Maggio in the industrial area of Presezzo west of Bergamo. Next to the street number 13, there’s a sign which reads “Attenti Al Cane”, and just behind this Beware of The Dog sign is a kennel built to accommodate an eager sharp toothed dog. Presented with this picture of Bertoletti’s leg biting canine, heavy metal fortifications and the number 13, you’d be forgiven for thinking that you’d just arrived on the film set of Hogans Heroes at Stalag 13. Beyond the fence though, you’ll see a Legend bicycles delivery van and some visible bicycle paraphernalia, confirming you’ve arrived at the right place. Once you’ve made it past the security, inside Bertoletti’s tightly run bicycle factory you’ll find four frame building specialists who are tirelessly immersed, building with all modern frame building materials, in a factory decked out with the most technically advanced frame building equipment. The Legend team is headed by Marco Bertoletti creator of the Legend Bicycles brand. 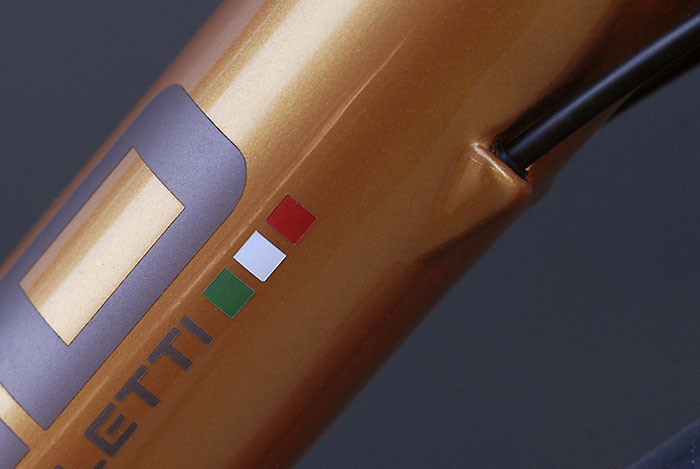 Bertoletti has been making custom bicycles for about forty years and reputedly builds custom frames for current pro riders, contracted to race for name brands. So what’s special about Bertoletti’s bikes? 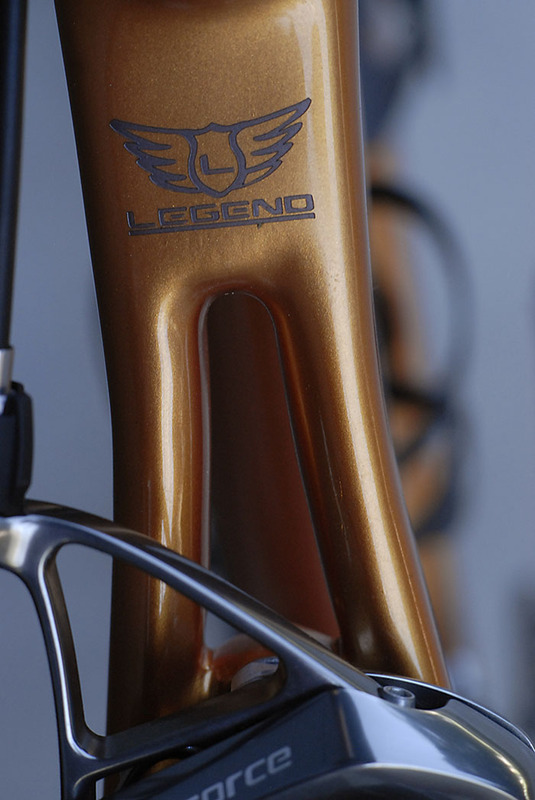 First we need to take a look at how bespoke bicycle builders like Legend arrived on the scene. Mass Produced Bicycles Since the inception of mass scale bicycle manufacturing in the late 19th century, there’s been a symbiotic relationship between the bicycle buying public and the mega bicycle factories. The only difference in recent years is that production has moved across to Asia and carbon fibre has become a very popular frame building material. For anyone buying one of these bikes, the R&D dollars that go into producing a top end carbon road frame, plus the packaging of group sets and wheels makes them an attractive proposition. For most bike riders buying a mass produced bike, this purchase is a no brainer. These bikes are built in a small number of sizes, usually small, medium, large and extra large and will fit most riders. Competently trained bike fit experts are at the ready to fit the rider to the bike. Easily interchangeable stems and posts go a long way to make certain these sizes will fit almost everyone. The system works. It’s easy to understand why in 2015, when you roll up at most popular bike rider coffee shops, parked out front will be a wall of off the shelf carbon bicycles. Adding weight to the argument, these bikes are race proven by pro’s. At your local bike shop you can order a near identical bike to the one ridden by your favourite pro rider, and even ride that bike over a classic course like Paris Roubaix. In this way cycle sport is easily accessible, this ease of access to the champions, the famed road courses and the bikes all fuels the passion for cycle sport. Choose a programme like Trek’s Project One and you can also customise you new machine. The amount of ride tuning options, compliance tuned seat masts and frame types, designed for time trials through to road racing on smooth or rough pavements and touring is so comprehensive, everyone’s spoilt for choice. For most riders a bicycle is meant for riding, and riding hard and fast means these mass produced bikes fit the bill well. Once you’re done with the frame it’s easy to upgrade or replace when damage occurs. The Bespoke Bicycle Alongside this model for mass distribution of bicycles there has always been a special place for the bespoke frame builder. These artisans have forged their names into the history books, some have become legends in their own right. Building bicycles using special techniques, for example the mid twentieth century French constructeur bicycles by builders like René Herse and Alex Singer, now highly collectable and noted for the complete design and in house construction of all component parts. Then there’s the frame builders who built custom racing machines for the top pro racers, builders like Giuseppe Pela who in the late 1960’s created custom frames for Merckx when he raced for Faema. Genuine Pela-Faema frames now prized by bicycle collectors. Worldwide small bespoke workshops built frames for club riders, randonneur specialists and for pro cyclists alike. The relationship with the bespoke builder for many successful bike racers was always an important aspect of their racing careers. For most of the twentieth century, steel was the favoured material for artisan frame builders. In the late 1980’s this all began to change. Recently I spoke to Frank Boifava from Carrera and Frank told me about the time when Dario Pegoretti learnt TIG welding. “Luigino Milani who was the main builder for Pinarello sent Dario to the United States to learn TIG welding, because no one in Italy was TIG welding. This was something new coming from the States. So Dario went to America to learn to TIG weld and he became one of the first TIG welders of bicycles in Italy.” The game changed from there, new technologies meant that frames could be mass produced using carbon, titanium and aluminium. Companies like Cannondale went to great lengths to convince the market that aluminium was a viable frame building material, this was the way of the future. Small manufacturers like Titanium High Technology, THT, began building titanium frames for Look. Marco Bonfantis’ Carbon C4 project, put custom made Italian carbon monocoque Bianchi branded bikes on the start line of time trials, at the Giro d’ Italia in 1987. The Dark Period This enthusiasm for materials innovation lead to a time which one of my bike nerd friends calls “The Dark Period”. The dark period began taking shape in the nineties, when aptly, black first became popular with cycling fashionistas. If you hadn’t kitted up in black, ditched your down tube shifters and migrated over to carbon, titanium or aluminium, you were behind the times. Carbon production didn’t have the current adaptability built into production processes. Scope was limited for customising carbon frames to suit either individual riders or various market segments. Today we see with each passing year, the “lightest ever” carbon frame announced. Professionals and bike racing fans alike, have a vast array of options for adaptable ride tuned machines available, whether mass produced to a pre-determined set of factory tested parameters or specifically designed and “custom tuned” in a small artisan bike factory. A far cry from the dark period. It’s also okay today to be seen once again, riding an old steel bicycle, no more shame hiding them away in a dark cobweb tangled corner of the shed. Custom Bike Components Running hand in hand with custom frame building, other components were custom made or customised by specialists. Leather saddles like Brooks appear today with rivets bearing the name “Ottusi”, Mario Ottusi was one north Italian artisan renowned as a race mechanic for riders like Charly Gaul. One of Mario’s talents was re-shaping and working leather saddles. This tradition continues in modern form with inventive coverings being applied to modern saddles by craftsmen like Mick Peel of Busyman Bicycles. Leather racing shoes were another big ticket custom made item. Then there were the crafts like pantographing and electro plating. In the 1970’s and 80’s, independent companies like American Classic, White Industries and Chris King Precision Components were emerging as reliable alternatives for bicycle components, paving the way for todays specialist innovators. 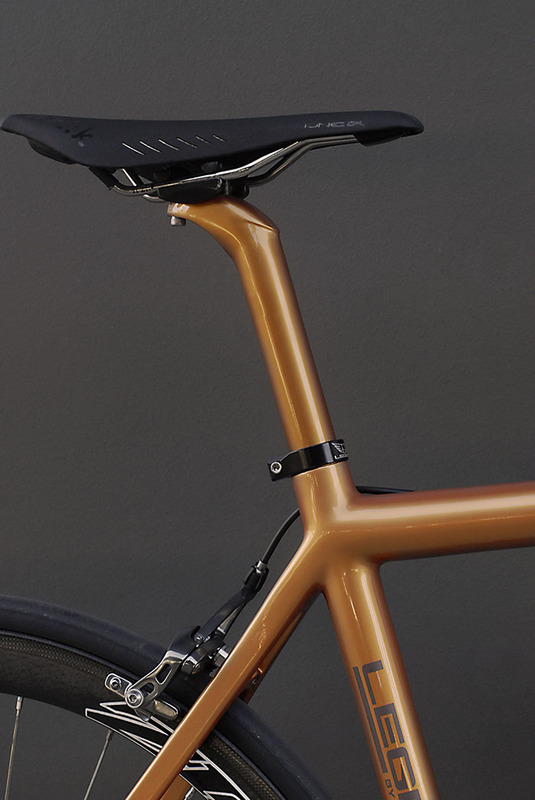 Bespoke Bicycle Building in 2015 While we’re enjoying the benefits of advancements made in modern bike tech, bespoke bike builders and specialist craftsmen are emerging or re-emerging in new ways. Not everyone wants to ride an off the peg bicycle and one alternative is to seek out the talents of the ever increasing number of artisans building frames and components. There are the steel frame builders, who had made their names in previous decades. Today these same frame builders are building for a different type of customer, Darrell McCulloch from Llewellyn Custom Bicycles, now builds for consumers wanting a hand made long lasting frame, or for the serious credit card tourer. Previously Darrell's clients were mostly racing cyclists who ordered custom track or road bikes. Some builders have come out of the woodwork, like Geoff Scott custom frame builder of Gefsco and Clamont, and businesses like Jim Bundy’s, now run by his son Peter Bundy, are finding a whole new generation of customers who appreciate handmade steel bicycles. Take a look at the extensive lineup of exhibitors at the North American Hand Made Bicycle Show or Bespoked - The UK Handmade Bicycle Show . The list of exhibitors at NAHBS also includes familiar names who’ve taken the world of bespoke cycling seriously, brands like Campagnolo, Reynolds, Columbus, Continental, DT Swiss, Maxxis, Mavic and Josh Poertner’s Indianapolis based Silca pumps. Josh has re-worked some of the old Silca pump designs into modern masterpieces, here the old world of cycling meets the new world, head on. All this gives the modern bike rider ample choice for constructing a bicycle that’s created as a one off that you won’t find any one else riding. The Legend On a recent Saturday morning ride, leant up against a wall at the coffee shop was an immaculate, bright orange Legend by Bertoletti, bearing all the hallmarks of precision. This bike was different, right from the get go the Legend sparked off the questions put forward here. It’s not often that you see a bicycle that grabs your attention that way, it turned out that Brisbane's Damien Taylor was riding the Legend, a custom HT 9.5. Once we got chatting I found out that Damien was not only our Queensland brand ambassador for Legend, he's also well known for helping other bike riders. Whether it's finding new roads to ride, welcoming them to town and getting them started, or sparking off enthusiasm for new training goals. I delved into the idiosyncrasies of Legend Bicycles, Bertoletti will build in steel, stainless steel, carbon, titanium or aluminium, or blends carbon and titanium together in his flagship model The Queen. Bertoletti says that he will build in any material with all measurements. 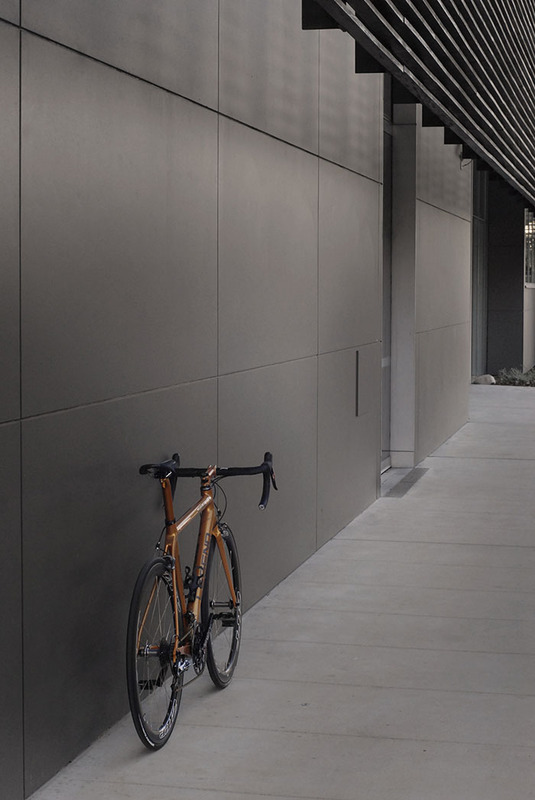 At Legend they are constantly engaged in improving materials and processes while seeking inspiration outside of the world of bicycles, looking at new technologies and processes. This approach allows access to a custom frame building company with an eye on current and future technology, yet you can still ask them to build you a traditional steel frame. All Legend Bicycles are finished by hand in the north of Italy with options for custom paint and laser etching on various components. Legend paint is finished in house and once you’re signed onto the Legend design programme there’s access to a vast range of colour choices. The thing that struck me about Legend is the attention to every small detail. Finishes on components like stems can be painted in complimentary colours to the frame. You can tweak the carbon layup on a Legend carbon frame to meet specific performance parameters, or request either a threaded BB or press fit. A couple of Bertoletti’s innovations include a CNC machined, tapered head tube for the ti Queen model and a squared off bottom bracket to improve stiffness. Your frame can be designed to run a mechanical groupset or electronic. Bertoletti can pretty much make anything you desire. Looking through the Legend catalogue, pantographing and chrome finishes haven’t been forgotten on steel. The standout carbon item that everyone wants is the “winged” Legend bidon cage, check out the photo set below. At Legend your frame will be built to fit you and no one else. With bike fit Bertoletti insists on reviewing videos of the riders position, then hammers out the correct details to create a correctly fitted bike for your intended purpose. There are other companies offering custom built carbon too, one example on an ever growing list is Denver based company, Alchemy. If you’re the kind of rider who can finish a bike with flair and imagination, builders like Bertoletti are an easy starting point to begin to create. Today we’re spoilt for choice with bespoke components, precision engineered options for components like headsets, wheels, seat posts, hubs. Couple this with access to artisans like Mick Peel for saddle and bar coverings, you can find just about anything being made bespoke these days, including stem caps! There’s no reason why your bike has to bear the mark of a factory built machine. Our local bike nerd likes to play the devils advocate though and suggests that there’s no need for customising anything in 2015, when a mass produced bike will tick all the boxes. On one level this works, you can thrash these factory machines within an inch of their existence and just front up and buy a new bike when it’s broken, or swap them over frequently. One question I often hear in conjunction with this is from riders who’ve been riding a couple of years or more and then either gravitate to building up an old steel bicycle for events like L’Eroica or ask themselves what other alternatives exist to broaden their stable of bikes, or riding opportunities. There’s a measure of pride in designing a unique one-off machine. Companies like Legend are leading the way. With technological advances in bike design coming so fast, the option to integrate the best that technology has to offer, with seemingly endless options for customisation, leaves us spoilt for choice, more than any other time in the history of cycling. Legend Bikes - Spoke and Chain Group are based in Logan Central, Queensland Australia and helped make this post possible. Damien Taylor allowed me to shoot his Legend 9.5, pictured below and a big thanks for his help in providing background information for this article. Damien is a Brisbane, Australia based cyclist who's passion for cycling is expressed through helping other bike riders push to new limits or find roads less travelled. Damien is widely followed on Strava and Instagram for his enthusiasm and ability to bring like minded cyclists and ideas together. Thanks also to Greg Softley for his hints on Ottusi. Frank Boifava for the conversations. "The Bike Nerd" for playing the devils advocate. Want a Legend contact the Legend Factory or your local distributor. Custom made carbon frame to clients own specs. Made to measure geometry Lively, stiff and compliant, with stability and control for fast descending. Race machine for any terrain. Sram Red brake lever on the Legend HT 9.5 Custom bike. Customise the graphics, paint, laser etching just about any aspect can be considered for customising your Legend Bicycle. Legend bicycles, graphics can be customised. 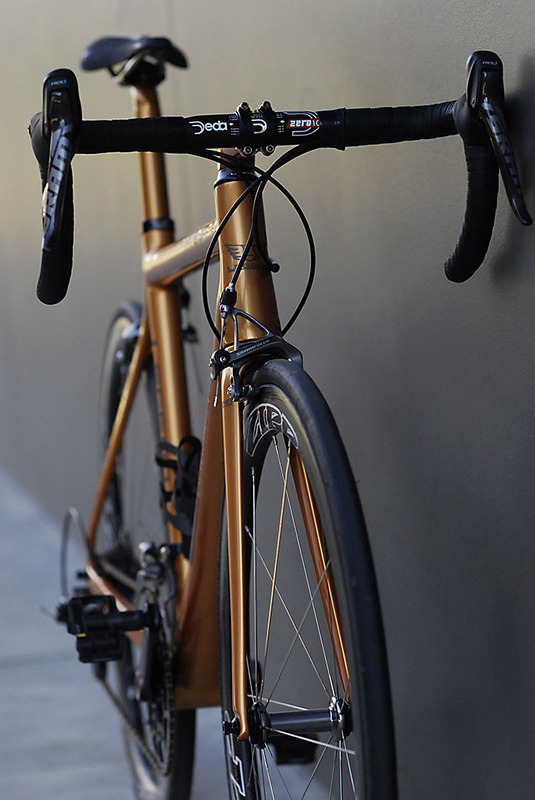 Legend Custom bicycles manufacture Titanium, Steel, Stainless Steel, Carbon and Aluminium. The choice is yours. 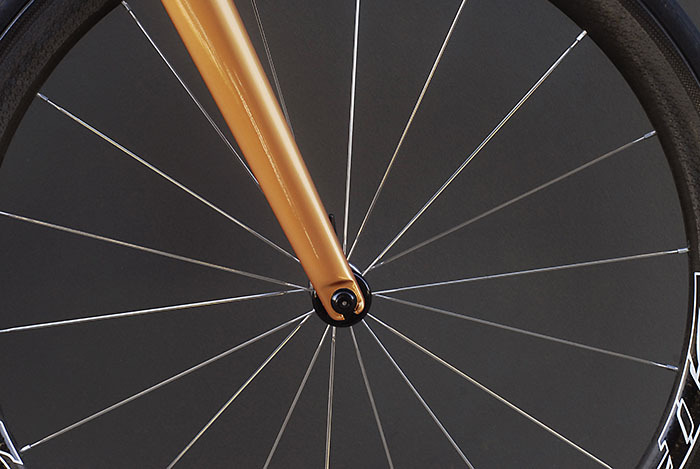 Burnt orange paint on Damien's Legend Bicycle, you can't miss this bike out on the road. The sinuous curves of Bertoletti's carbon bicycle frames will draw you in for a closer look. You have to look closely at every detail on Bertoletti's Legends. Right down to laser etched logo's on wheel sets, it takes some time to appreciate the level of detail. Carbon Zipp 303's matched with the stylised Legend HT 9.5 frame. 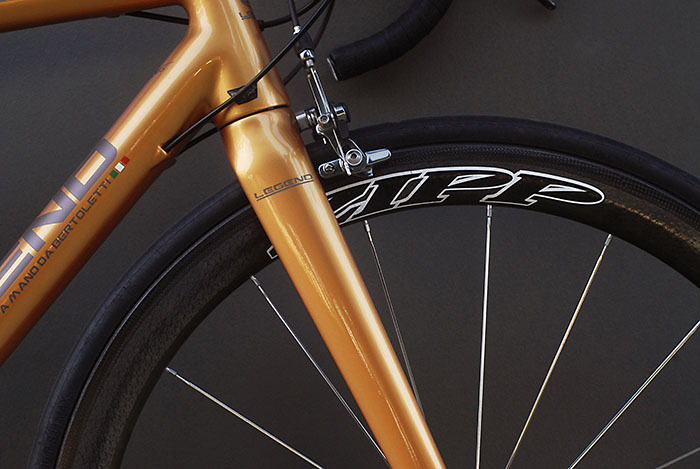 Legend by Bertoletti Bicycles show clean lines. Damien's 9.5 has a colour matched chain. Crisp fork design blends seamlessly with the Zipp 303 front wheel. Custom graphics and paint on the Deda stem and stem top cap. Italian heritage of the Legend imposed on the decal details. 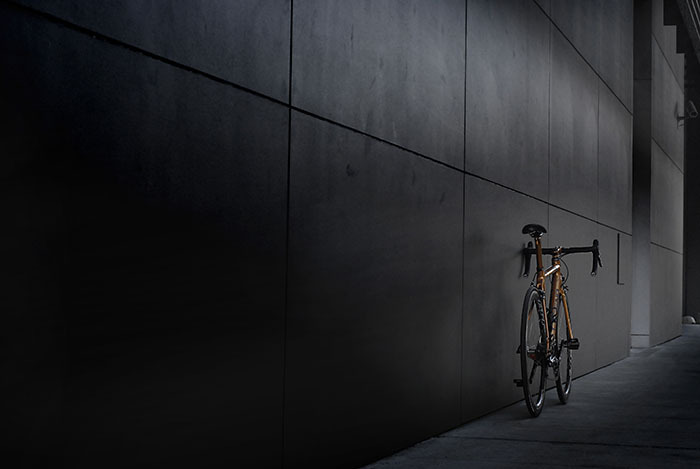 Legend Bicycles engineered with tight tolerances. Custom Deda stem top cap with Legend Bicycles graphics. 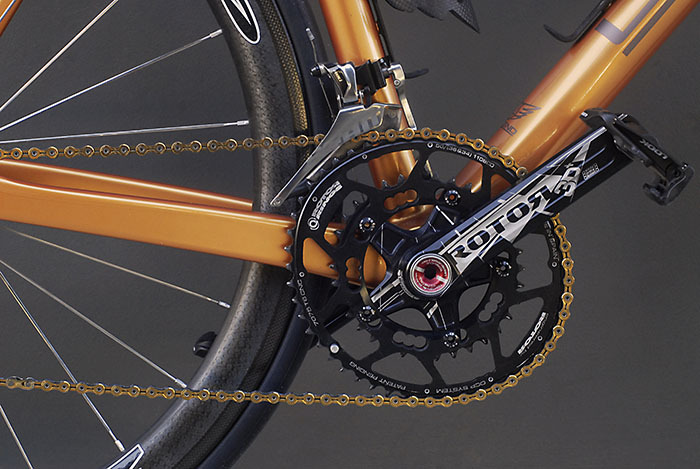 KMC XXSP chain 10 speed X10 SL Titanium nitride gold coated super light 253 grams. Those special highly sought after, custom Legend, Bertoletti carbon cycling water bottle / bidon cages. Bertoletti winged custom carbon cycling bidon cages. Newer PostErnie Old Cycling "By Bread Alone"